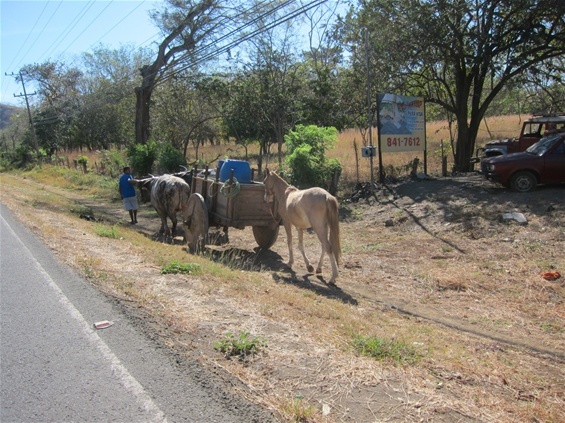 Blasting mariachi music, the vibration of the engine, and a lopsided bathroom door banging continually against Lauren’s knee gave our bus ride the full flavor of a foreign experience as we sped toward the border between Costa Rica and Nicaragua. Sugar cane fields flashed by, small purple, orange, and lime green buildings peeked out behind explosions of bulganvilia, horseback riders came from nowhere, some carrying machetes and toddlers. Acres of grassland flecked with skinny white cows and bicyclists peddling down dirt roads gave the scenery a sweet peacefulness and infused us all with excited speculations about what in the world we might see next.